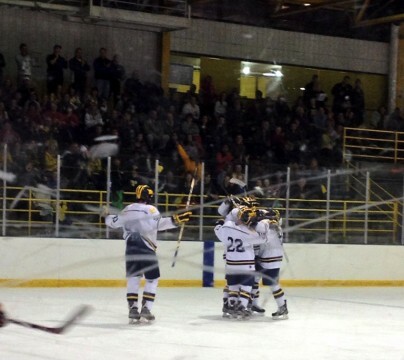 The University of Michigan-Dearborn hockey team swept Indiana Tech in its season-opening weekend series. 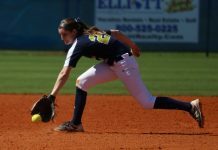 The Wolverines won 9-2 Friday and closed out the series with a 9-3 win Saturday. 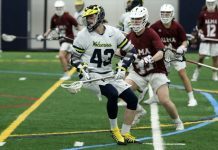 Freshman, Jeff McFarland, scored six goals in his Wolverines debut. Senior Captain, Jase Paciocco, finished with seven points, while freshman, Ryan Urso, totaled five points. Fellow freshman Goalie, Nate Ferris, played all 120 minutes and made 50-of-55 saves in his debut. The Wolverines were able to score early Friday, and they scored often. McFarland opened it up seven minutes into the first period with a tremendous backhand shot while on the penalty kill. The Wolverines were able to score three shorthanded goals in the first period, going on to put on a clinic against Indiana Tech in a 9-2 win. Just 39 seconds after McFarland opened up the scoring Friday, junior, Ryan Kelly, buried a shorthanded goal, the second of the period for the Wolverines. 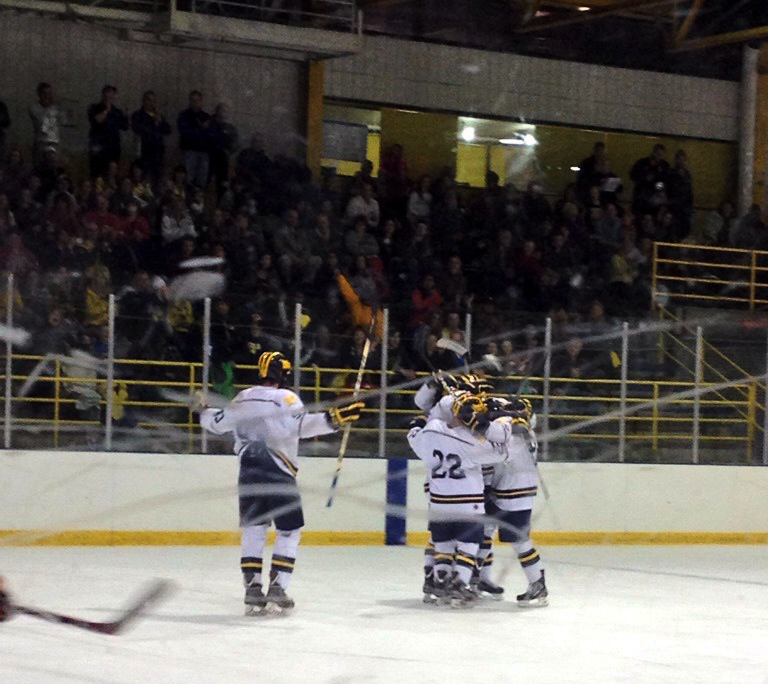 Seven minutes after Kelly’s goal, Urso posted his first career goal at UM-Dearborn, scoring the Wolverines third shorthanded goal of the game in the first period. Ferris was given the nod in net, posting a solid game and taking care of business, as he had a busy night. Sophomore, Derek Kessler, opened up the scoring in the second period about 10 minutes in, netting his first goal of the year. The Wolverines did not stop there for the period. TJ Zak, Cody Longuski, and Marcus McSweeney all netted goals in the second period. Gino Darin scored a little over five minutes into the third period, after a beautiful assist from Paciocco. But Ferris stole the show, taking his shutout deep into the third period, before conceding a couple of goals down two men on a penalty kill. “The guys in front of me took away a lot of the scoring chances, they gave me easy shots from the outside, making it easy and not too challenging of a night,” Ferris said, when asked about his performance on his opening game. UM-Dearborn hockey Head Coach, Chris Haltinner, was impressed with his goalie’s performance in his debut. The Wolverines took 14 penalties in Friday’s win, something Haltinner was not pleased about. UM-Dearborn had 13 penalties Saturday. “We gotta settle down, be more aware of stuff, and be more disciplined,” Haltinner said. 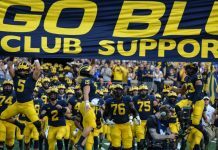 The penalties did not hurt the Wolverines, in fact it did the opposite, as the Wolverines scored three times shorthanded. 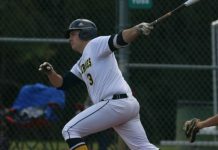 UM-Dearborn took the weekend sweep on Saturday, winning 9-3. McFarland scored four goals for the Wolverines. Also contributing to the blowout win was Kessler with two goals. Urso and Paciocco totaled three points. The Wolverines return to action Friday for a weekend road series against Pittsburgh.